Cities lie in twisted ruins. The earth smolders and burns. Men live in sewers. In this violence-ravaged world there is just one law left; the law of survival. 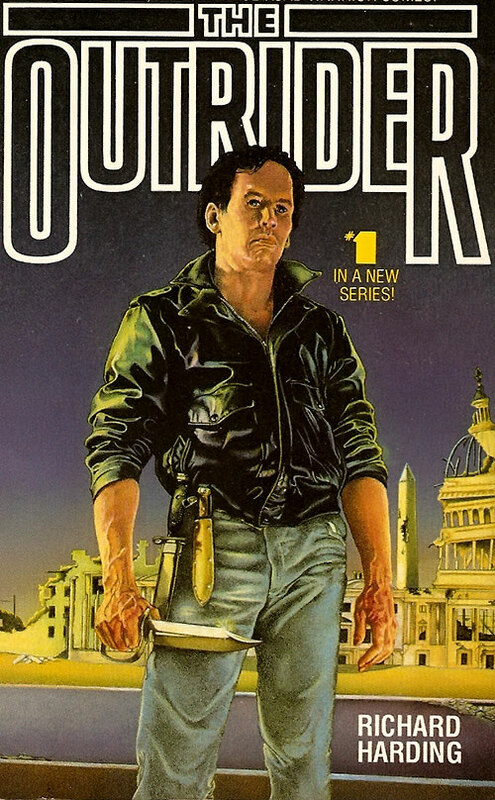 Bonner the Outrider is another post-apocalyptic warrior hero. Author Richard Harding seemingly specialised in cruel and outrageous gore – supposedly as a social criticism – most certainly not for the squeamish. 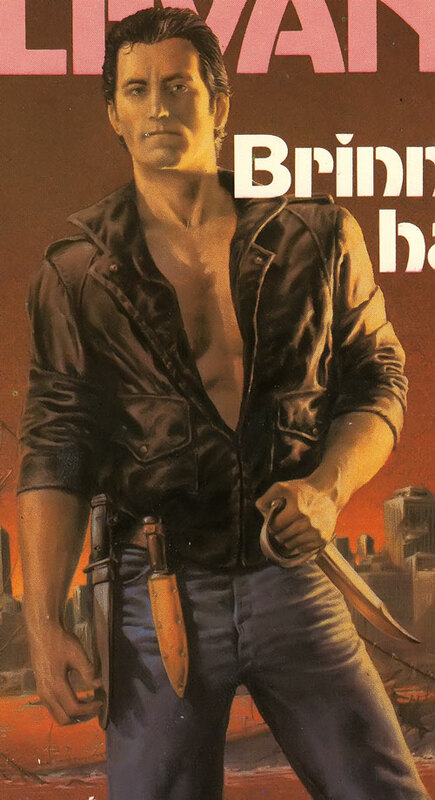 This series of cheap, macho, less-than-top-shelf novels started in 1984, after the Mad Max movies established a new school of post-apoc aesthetics. Base Of Operations: Post-apocalyptic Chicago or mobile. Bonner is a post-apocalyptic warrior, scavenger and traveler. He possesses numerous useful survival, combat and knowledge skills! Bonner’s shark-like mode of transport is a gas-driven, one-seated vehicle. His friend Lucky built it for him using spare parts from many sources. The car has pretty used up breaks, but is otherwise well-maintained. It has no closed body, but consists of a large, black bow. It has a gas tank, four broad wheels, double upturned exhaust pipes in the back and a powerful spotlight mounted in the front. The engine is a powerful, straight eight cylinder Chrysler engine of quality 5. Thus, this car fully capable of chasing or driving away from most anything found on the post-Apocalyptic roads. Behind the seat is found a small compartment large enough for some luggage or a passenger. The vehicle comes armed with a heavy machinegun of caliber .50 mounted at the top of the bow. Bonner must stop the car in order to use it if riding alone, although it can otherwise be used by a fellow gunner riding the vehicle. 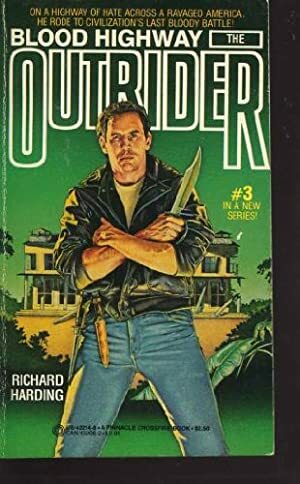 Bonner used to belong to an outfit named the Outriders (there were actually several gangs of Outriders in earlier times). They traveled everywhere in the post-American wastelands looking for forgotten and hidden supplies and storage facilities, in order to then sell their findings. They occasionally had to fight their way past various highwaymen, gangs and the troops of local rulers, and they were very good at their job. The original Outriders consisted of Bonner, Beck and Leatherman and more. They eventually split up after having gained fame and richness. Bonner and Beck – a very large man – continued on as smugglers and gatherers. Meanwhile Leatherman carved himself a large empire from several old U.S. states. Eventually, Bonner put together a new gang of Outriders. It consisted of Bonner, Beck, Seth, Harvey and Starling. In game terms he naturally has a High Level Connection to each and every one of them. However, over the course of several adventures Harvey and Starling died, as they became enemies of former colleague Leatherman and his army. Jean Baptiste, the leader of his gang of (Canadian) Les Habitants. The Mean Brothers, humongous mute melee twin warriors (w/STR 06 in DC Heroes terms). Nowadays, Bonner sells whatever he can find, but he always keeps the best weapons, gas and pieces of gold (the common currency on the entire continent) for himself as his rewards. Several generations after a great plague decimated the populations of the world scattered masses of survivors still cling to life on the American continent. There are now four larger states with low populations ruled by tyrants, and a few free outposts, including Chicago. The tyrants naturally control everything with gangs, motorized troops, tax collectors and so on. Large areas of the American south encompass the so-called Hot States, which is controlled by Berger and his Devil’s Brigade, with its main set of power at a large ranch in Texas. The larger area around Minneapolis and ways northwards, referred to as the Snow States, is controlled by Carey, whose Snow Patrols are known for their high speed and ability to cross any terrain. The Slave States east of the Appalachian mountains is controlled by the worst of them all, Leatherman, who has his base in former Washington and his Storm Troopers, a band of mutated, rotting, fearless commandos. The fourth state is another little explored or known slave state beyond the Rocky Mountains along the western coastline, controlled by some rich man. Canada, also sparsely populated, is free land, and the Snow Patrols sometimes raid these areas. The major highways are filled with highwaymen and other gangs that raid not only travelers but also the various states and their convoys, transports and supplies. Some of these groups make up their own unique cultures and societies, such as the lesbian band of the Sisters, the short Dwarves and the cannibalistic Hungry. Post-apocalyptic Chicago, the last open city in former America, is a den for the tough and the dangerous smugglers, plunderers and former Outriders with Dorca’s Bar as the central hub. Naturally, the existence of Chicago, which now has more land than ever before after the Great Seas have been partly emptied, is a problem for all the tyrants. There are still farmers and fishermen there, as there used to be some years back when only a few, brave dared explore the post-apocalyptic continent. One of the first explorers was a man named Bonner. Bonner dreamed of reconstructing the great land that he had read about in books. He roamed the wastelands by car, got to know the roads, various contacts, and established trade routes and information networks. Soon others joined him: Leatherman, Dara, Beck, Seth, Berger, Starling, Carey and a few others. The gang became known as the first group of Outriders, a very resourceful group of people. They grew into a modern legend of hope and were respected by everyone… until everything went wrong. Leatherman exploited the networks and knowledge for personal gain and established the Slave States. Soon, Carey followed his example, as did Berger, and they built their own ruthless feudal states. Soon, almost everyone lived in serfdom, except for the few that managed to get to the free city of Chicago. At that point Bonner’s dream of reconstruction was dead, as dead as his beloved Dara at the hands of Leatherman. Bonner now resides in Chicago, when not on the roads, and he still helps his former friends there, but the rest of his time is spend dreaming of wreaking revenge on Leatherman one of these days. Bonner went on to have many adventures in the wastelands and managed to do much good with his new gang of Outriders. He eventually got his revenge and made a positive impact on the post-apocalyptic world. Bonner has short-cut, black hair, rough face and rough hands. He is usually clad in a pair of jeans, a T-shirt, a black leather jacket and a pair of heavy boots. 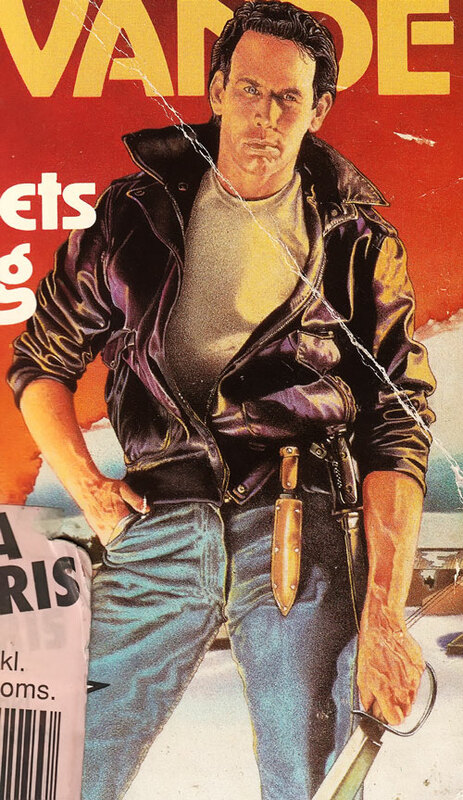 He wears several weapons in various holsters, including the throwing knives in his belt. He usually wears a relaxed but unreadable poker face. Bonner is actually a post-apocalyptic hero, a famous liberator and the bane of tyrants. He is a maverick, smuggler and survivalist. Bonner scavenges the desolate country in his customized war wagon. Grim, wary, armed to the teeth, he roams the nightmare land, searching. While principled he is not a kind man. He is a rather famous combatant and Outrider with a basic kill or be killed mentality. He kills without pleasure as he realizes that once he begins to enjoy it his humanity has been lost. In fact, he can still be shocked by seeing senseless brutality – he does not abide by unnecessary cruelty against the relatively innocent. Bonner will even take the time to burrow victims of violence that he finds on his journeys. Still, in combat he has nerves of steel, and decimates his enemies quickly and remorselessly almost like a machine. He is convinced of that everybody left alive is guilty of something bad, some more than others. Bonner has a sort of dry, barbarian sense of humor. His greatest enemy is hatred, which he fights to suppress despite all the horrors and injustices that he has seen and endured. He never forgets any past transgression against him or others and he keeps a revenge list in his mind – as such, he is a ruthless believer in revenge – thinking of it as justice – and no body is worse than Leatherman in terms of karmic payback, particularly since Letherman cost him the life of his beloved Dara. He is exceptionally loyal to the few friends that he has, and he always keeps his word. His basic belief is that there is no hope left, only hate, and still he fights to remain a civilized human being. Bonner is very good at ambushes and is no foolish believer in a fair fight. While he doesn’t personally care about riches, he does insist on having the best weaponry and vehicles available and he will pay for it to maximize his chances of survival. Further, some say that Bonner merely thinks too much about things that nobody can answer (for example: what were those white lines in the middle of the road really for?). Others claim that he is undefeated on the roads not because he is tougher or more skilled than others, but because he is smarter and thinks more. He does in fact collect books and reads a lot – he is something of a bibliophile. Still, there is a lot about the old world that he will never understand, and understanding it completely is his greatest passion and desire. Therefore, while traveling, he ponders the strange messages of commercials, posters, cinema theaters and other matters, very little of which makes any sense. How could fifty different states keep from constantly warring on each other? So, naturally, he wants to know the reason behind the war (all of which serves as a method to present the past history and to provide some political criticism while at it to the readers without being overly contrived about it). Supermatic Citation 22-A Automatic Pistol [BODY 02, Projectile weapons: 02, Range: 04, Ammo: 10, R#03]. A .22 LR target-shooting pistol carried as a backup. If Bonner uses it he will likely go for a Critical to compensate for the low-powered ammunition. Purdey revolver [BODY 03, Projectile weapon: 04, Ammo: 06, R#0]. While the model and calibre were unspecified, it had probably been rechambered to shoot .38 Special bullets. Standard Steyr AUG [BODY 04, Projectile weapons: 06, Ammo: 08, R#02, Advantage : Autofire]. The AUG is a very deadly weapon in the hands of Bonner! COMBAT CAR [BODY 04, STR 04, Running 07, R#2] w/.50 HMG [BODY 06, Projectile weapons: 09, Ammo: 10, R#02]. See the Powers & Abilities section for more. Writeup completed on the 15th of December, 2013.